This paper deals with a Holling type III diffusive predator-prey model with stage structure and nonlinear density restriction in the space . We first consider the asymptotical stability of equilibrium points for the model of ODE type. Then, the existence and uniform boundedness of global solutions and stability of the equilibrium points for the model of weakly coupled reaction-diffusion type are discussed. Finally, the global existence and the convergence of solutions for the model of cross-diffusion type are investigated when the space dimension is less than 6. Population models with stage structure have been investigated by many researchers, and various methods and techniques have been used to study the existence and qualitative properties of solutions [1–9]. However, most of the discussions in these works are devoted to either systems of ODE or weakly coupled systems of reaction-diffusion equations. In this paper we investigate the global existence and convergence of solutions for a strongly coupled cross-diffusion predator-prey model with stage structure and nonlinear density restriction. Nonlinear problems of this kind are quite difficult to deal with since the usual idea to apply maximum principle arguments to get priori estimates cannot be used here . where , denote the density of the immature and mature population of the prey, respectively, is the density of the predator. For the prey, the immature population is nonlinear density restriction. is assumed to consume with Holling type III functional response and contributes to its growth with rate . For more details on the backgrounds of this model see references [11, 12]. where is a bounded domain in with smooth boundary , is the outward unit normal vector on , and . are nonnegative smooth functions on . The diffusion coefficients are positive constants. The homogeneous Neumann boundary condition indicates that system (1.3) is self-contained with zero population flux across the boundary. The knowledge for system (1.3) is limited (see [13–17]). where are the diffusion rates of the three species, respectively. are referred as self-diffusion pressures, and is cross-diffusion pressure. The term self-diffusion implies the movement of individuals from a higher to a lower concentration region. Cross-diffusion expresses the population fluxes of one species due to the presence of the other species. The value of the cross-diffusion coefficient may be positive, negative, or zero. The term positive cross-diffusion coefficient denotes the movement of the species in the direction of lower concentration of another species and negative cross-diffusion coefficient denotes that one species tends to diffuse in the direction of higher concentration of another species . For , problem (1.4) becomes strongly coupled with a full diffusion matrix. As far as the authors are aware, very few results are known for cross-diffusion systems with stage-structure. The main purpose of this paper is to study the asymptotic behavior of the solutions for the reaction-diffusion system (1.3), the global existence, and the convergence of solutions for the cross-diffusion system (1.4). The paper will be organized as follows. In Section 2 a linear stability analysis of equilibrium points for the ODE system (1.2) is given. In Section 3 the uniform bound of the solution and stability of the equilibrium points to the weakly coupled system (1.3) are proved. Section 4 deals with the existence and the convergence of global solutions for the strongly coupled system (1.4). where . Let one curve : , and the other curve : . Obviously, passes the point . Noting that attains its maximum at , thus when , . has the asymptote and passes the point . In this case, and have unique intersection , as shown in Figure 1. is the unique positive equilibrium point of (1.2), where , , . In addition, the restriction of the existence of the positive equilibrium can be removed, if . The characteristic equation of ( ) is . is a saddle for . In addition, the dimensions of the local unstable and stable manifold of are 1 and 2, respectively. is locally asymptotically stable for . According to Routh-Hurwitz criterion, is locally asymptotically stable for and , that is, and . According to Routh-Hurwitz criterion, is locally asymptotically stable for . Obviously, can be checked by (2.1). Now we discuss the global stability of equilibrium points for (1.2). hold, then the equilibrium point of (1.2) is globally asymptotically stable. Assume that , and hold, then the equilibrium point of (1.2) is globally asymptotically stable. Assume that holds, then the equilibrium point of (1.2) is globally asymptotically stable. When , the minimum of and is and 0, respectively; the maximum of is are and , respectively. Thus, when (2.8) hold, According to the Lyapunov-LaSalle invariance principle , is globally asymptotically stable if (2.1)–(2.3) hold. Thus, for . This completes the proof of Theorem 2.1. 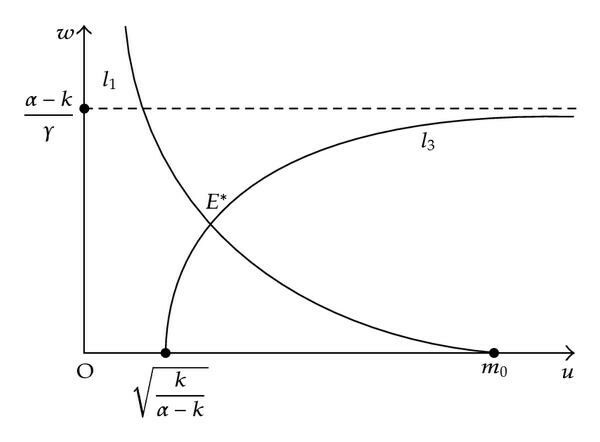 In this section we discuss the existence, uniform boundedness of global solutions, and the stability of constant equilibrium solutions for the weakly coupled reaction-diffusion system (1.3). In particular, the unstability results in Section 2 also hold for system (1.3) because solutions of (1.2) are also solutions of (1.3). on . In particular, if , then for all . It is easily seen that is sufficiently smooth in and possesses a mixed quasimonotone property in . In addition, and are a pair of lower-upper solutions of problem (1.3) (cf. in (3.1)). From [29, Theorem 5.3.4], we conclude that (1.3) exists a unique classical solution satisfying (3.1). According to strong maximum principle, it follows that . So the proof of the Theorem is completed. Now we show the local and global stability of constant equilibrium solutions for (1.3), respectively. Assume that (2.1) holds, then the equilibrium point of (1.3) is locally asymptotically stable. Assume that , , and hold, then the equilibrium point of (1.3) is locally asymptotically stable. Assume that holds, then the equilibrium point of (1.3) is locally asymptotically stable. From Routh-Hurwitz criterion, we can see that three eigenvalues (denoted by , , ) all have negative real parts if and only if . Noting that , we must have . It is easy to check that if (see Section 2). Let , then . Let , then (3.7) holds. According to [30, Theorem 5.1.1], we have the locally asymptotically stability of . The three roots of all have negative real parts for and . Namely, is the locally asymptotically stable, if and . Similar to (i), is locally asymptotically stable, when . When denote . If , then (1.3) has the semitrivial equilibrium point , where . If , then (1.3) has a unique positive equilibrium point . Similar as Theorem 3.3, we have the following. (i)If , , and (namely, , , ), then is locally asymptotically stable. (ii)If and , then is locally asymptotically stable. (iii)If , then is locally asymptotically stable. Before discussing the global stability, we give an important lemma which has been proved in [31, Lemma ] or in [32, Lemma ]. hold, then the equilibrium point of system (1.3) is globally asymptotically stable. Assume that , and hold, then the equilibrium point of system (1.3) is globally asymptotically stable. (iii)Assume that and hold, then the equilibrium point of system (1.3) is globally asymptotically stable. By Theorem 3.1, is defined well for all solutions of (1.3) with the initial functions . It is easily see that and if and only if . In view of Theorem 3.3, we can conclude that is globally asymptotically stable. Therefore, It follows that the equilibrium point of (1.3) is globally asymptotically stable. The following proof is similar to (i). When , Theorem 3.6 shows the following. hold, then the equilibrium point of (1.3) is globally asymptotically stable. Assume that hold, then the equilibrium point of (1.3) is globally asymptotically stable. Assume that and hold, then the equilibrium point of (1.3) is globally asymptotically stable. Using the software Matlab, one can obtain , . It is easy to see that the previous system satisfies the all conditions of Theorem 3.6(i). So the positive equilibrium point (0.5637,0.5637,0.1199) of the previous system is globally asymptotically stable. By [34–36], we have the following result. In this section, we consider the existence and the convergence of global solutions to the system (1.4). In order to prove Theorem 4.2, some preparations are collected firstly. From the maximum principle for parabolic equations, it is not hard to verify that and is bounded. where are functions of and so are bounded because of Lemma 4.3. Lemma 4.5 (see [23, Lemmas 2.3 and 2.4]). for any with for all . To obtain -estimates of , we establish -estimates of in the following lemma. where is arbitrary and . where . Therefore is bounded from (4.30). From (4.29), we have . Namely, , . Combining (4.28), we have , where . Setting in (4.20) (it is easily checked that , i.e., ), we have . The result of can be obtained from an analogue of the previous proof of 's. where , , , is symbol. It follows from Lemma 4.6 that , . It follows from [37, Lemma , page 80] that and so . Recall from Lemma 4.6 that , so that by applying Theorem [37, Page 181] to (4.33). Firstly, Theorem 4.2 can be proved in a similar way as Theorem in [21, 25] when the space dimension . In particular, to conclude , we need to repeat the above bootstrap technique. Since is arbitrary, so the classical solution of (1.4) exists globally in time. Now we discuss the global stability of the positive equilibrium (see Section 2) for (1.4). provided that is large enough. This implies that . So the proof of Theorem 4.8 is completed. This work has been partially supported by the China National Natural Science Foundation (no. 10871160), the NSF of Gansu Province (no. 096RJZA118), the Scientific Research Fund of Gansu Provincial Education Department, and NWNU-KJCXGC-03-47 Foundation.